Some of you may have noticed a lack of information about “Craft Beer Rising” in my previous postings. I will admit, it’s due to a slight twinge of bitterness and resentment. This doesn’t come from anything that the CBR14 crew did or any lack of interest in the events; quite the contrary. It stems from jealousy. You see, on the morning of Feb 22, I was on Qantas flight QF970 heading to sunny Townsville and have been here ever since. With a noticeable lack of good venues up here, it’s easy to see why I might harbour a bit of ill-will towards you lucky folks who got to attend the phenomenal events hosted across the country. Now, I should not have allowed this personal, inner turmoil to spill out into a lack of reporting. You can’t help in the fight for good beer if you’re aren’t providing all the information. So, to you readers, event organizers, and to Crafty Pint, I am truly sorry. I’ll try not to let this get in the way again. That being said, I DID try and make something happen out here. On the Brews and Bacon Facebook page (check it out if you haven’t yet, it’s new! ), I posted an event for anyone interested in talking and drinking beer at the one venue where you can get a decent drop in Townsville, the Townsville Brewery. I called it an Unofficial Craft Beer Rising event to make myself feel better about missing festivities back in Brisbane, and invited friends and urged them to invite others and share the event. Being as I am still a fledgling blog, I honestly expected to be sitting there by myself, drinking schooner after schooner until I stumbled out of the venue, took a taxi home, and cried myself to sleep. This was almost the case, as a few personal friends who said they’d be by to join me ended up cancelling last minute. I was surprised, however to have a few people show up! Righteous Brewers Townsville (RBT… get it..), whom I had off-handedly contacted to see if they wanted to get involved, came to my rescue. 6 folks from the Townsville amateur brewing club made their way down to the Brewery and joined me in libations. 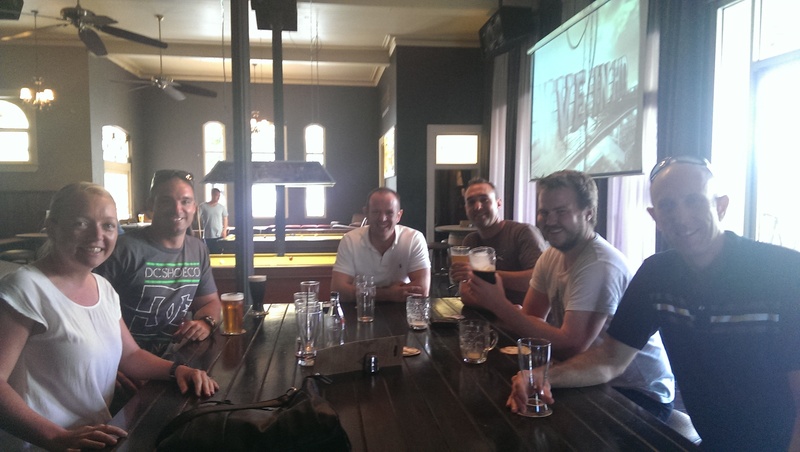 An easy-going bunch, we sat around and talked beer, brewing in Townsville, the future of venues in FNQ, and as the day wore on, a bit of drunken rambling. Their range in brewing experience ranged from a few months to several years, so I was really interested to see their take on the beer environment they were in. From everything I gathered, it appears that Townsville has quite the uphill battle ahead of itself. The Brewery is one venue you can sit down and have a fresh, proper beer, and Dan Murphy’s taking the title of only place you can pick up something crafty. I can vouch for that wholly as my second day here, I walked into the local “Cellerbrations” and the beer fridge was the same size as the pre-mixed beverages fridge. The only redeeming drink in there was a Little Creatures Pale Ale, which I swooped on and held it tightly as a ward against the XXXX surrounding it. I had to take the trip to one of 3 Dan’s in Townsville to pick myself up something decent (a Burleigh Hasslehop made it’s way home, and after I have another, expect a review). With a lack of venues promoting good beer, it’s made it much harder to convince the unknowing public of what beer can and should be, but it appears the RBT folks are on the case. This has given me a much stronger perspective on how lucky we are in Brisbane. You can pretty much throw a stone at this point and find somewhere that serves a good brew. New venues are popping up everywhere and even our big chain bottle-o’s are carrying better products. Participation in events like Craft Beer Rising and the upcoming Brewsvegas just go to show how fortunate we are to have venues, brewers, organizers, and punters who care about quality. I think with enough effort, Townsville can slowly change the way people think about the fizzy yellow stuff they’ve been ingesting and look towards a fresher, more flavourful alternative. It may just take one new venue to be ballsy enough to carry some wacky beers and shock this town into realization. The most humbling experience, I must say, was the fact that the Righteous Brewers Townsville actually came out and wanted to hear what I had to say. I was asked questions about Brisbane and how it’s growing, the brewers in SEQ, and what I think Townsville needs to get to the next level. To have my opinion regarded is something, I must admit, very new to me. I can only hope that I provided something insightful and not-to-far off the mark. Thank you to the RBT gang and to Townsville Brewery for setting the scene and tapping tasty, tasty beers (more on these in a later post). It was a great time and if you’re ever down in Brisbane, give me a shout and I’ll introduce you to people who know WAY more about beer than I ever will. All in all, I’d say I had a good Craft Beer Rising.